A highly spiced, spreadable meat paste traditionally made of pork, goose or duck, but also fish and rabbit. The meat for the Rillete is cooked in seasoned fat and then shredded or pounded into a paste. After being made, the Rillette is commonly aged by placing it in small dishes such as ramekins and spreading a thin layer of fat over the top to seal it while it matures allowing the flavors to blend. Ingredients often added to the meat include roasted wheat crumbs, white wine combined with seasonings such as herbs, garlic, salt, and pepper. 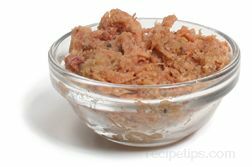 The Rillette meat paste is typically served as an appetizer that is spread over crackers or small pieces of bread.